Video conferencing has long since surpassed solely being utilized in the conference or board room. In fact, the enterprise video market, which includes video conferencing, will reach $36.5 billion by next year. Video conferencing is used across the workplace spectrum from internal communications to external sales calls and everything in between. 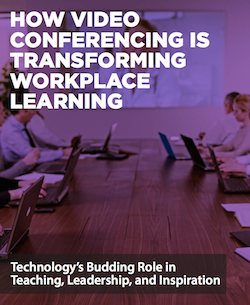 You may or may not already be utilizing video conferencing in your business, either way, make sure to download and read our latest guide How Video Conferencing is Transforming Workplace Learning to see how you can better implement video at your company today.